The Breton Federalist Alliance is honored to receive the Dalai-Lama in Nantes, south Brittany. In name of breton people we want him to know how much his high spirited conduct is appriciated here on the old breton soil. We too, stay side by side with the tibetan people fighting since decades for a kind of self government, respect for its religious values and right to happiness. Long life to the tibetan-breton friendship. Support for the tibetan people. 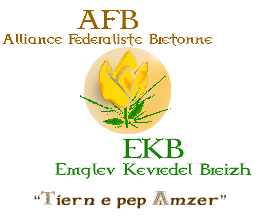 The AFB-EKB condemns the repression being exercised on the tibetan people. For over 50 years, the latter has been fighting - under the Dalai-Lama's high moral authority - non-violently to conserve its physical and spiritual existence. The AFB-EKB is adressing, both to the exiled tibetan government and the Dalai-Lama, assurances of their solidarity. Since it is closely joined to the chinese province of Shan Dung, Brittany cannot close its eyes to this situation. The breton people, being also a minority, is all the more concerned. Also, the AFB-EKB demands that President Jean-Yves Le Drian makes Bretons reprobation known to the chinese government and that Bretons wish to see tibetan people's rights respected. Federalist that means rejecting extreme wingright and wingleft, cooperation with neighbours inside and outside the french state. We are aiming for a federal Europe based on recognaissance of it's different peoples. We strongly reject violence. Blocking of the Port of St Nazer by Turballais. The point of view of the AFB-EKB. The fishermen of Turballe rise against the directive of Brussels which recommends a stop of fishing to Anchovy in order to protect the resource. One thus measures the brittleness of a port whose activity rests since too a long time on the single fishing mode. In addition the territorial cutting created by Pétain and devoted by Olivier Guichard and his successors does nothing but weaken the answer given to a major economic problem for the fishermen of Turballe. Their problem must fall under the total maritime activity of the whole of Brittany. The Basque example is there which shows that only a direct representation of Breton in Brussels will make it possible to tie a constructive dialogue uninterrupted with the European authorities in order to find compromises between the essential safeguarding of the resource and the not less legitimate interests of the Breton maritime world. We define ourselves as an association that fights in favour of a "home rule" for Brittany. Therefore we cannot accept Brittany's division, which was forced onto us. This state of fact has been lasting for 65 years. Consequently, we would like to point out that none of the successive French government (whatever its political affiliation) ever questioned this unfair division that was imposed by a regime, which is itself considered to be a mere parenthesis in the history of the French Republic. We therefore concluded that in some cases the decisions that were taken under Pétain's government are not only acceptable but also fair in the Fifth Republic's opinion. We also came to the conclusion that the only reason for accepting such decisions is their main aim; i.e. the weakening of Brittany by depriving it of one part of its history and of its economic potential. It is exactly on this latter point that we would like to focus our fight, because it is the departure point for a better future. That is also why we do refuse to speak about "historical Brittany". It refers too much to the past to better bury us. Therefore, we would rather talk about "undivided Brittany", because it refers to the whole Brittany, its territory, its population, its economic potential and therefore its capacity to fight. This will lead to the set up of a certain type of political representation that would reflect the needs of our era. It is therefore necessary to ally some requirements such as social cohesion, identity and globalisation even though they apparently contradict each other. Only this situation could be called fair democracy. Even though many of us agree with the aim, the problem remains the method to be used to get there. It seems that until now we contented ourselves with slogans that were more or less regularly supported by demonstrations, which then acted as high mass. Some may think it to be iconoclastic to question the CUAB's method, which by the way has recently become "United Bretagne" (Bretagne Réunie), evidence of an actual semantic progress. Nevertheless, this organisation failed to reach a clear "modus operandi" to enlight the various activists that were involved in this fight. This organisation also accepted to put aside some of the most serious and solid Breton political groups involved in this fight. It also wrongly organised most of the demonstrations in Loire Atlantique. Did the leaders of Bretagne Réunie consider seriously the consequences of a referendum: intense preparations and huge logistic means to counter state propaganda? Why don't they take advantage of the 2007 presidential elections instead of waiting for 2008 to put forward the "United Brittany" issue as an electoral stake? We would like to discuss all these points with the President and its staff. However, we have not received any answer to our three letters yet. Should we conclude that the fight in favour of reunification should remain a lost cause? We rather keep wishing that we were victims of misunderstandings and that, this time, an actual dialogue will be set up. Concerning the content: the whole Breton population should feel concerned. To do so, we need to attract the attention of the media in the four other departments and to demonstrate. Concerning the form: those of the political groups that wish so will get their seats back within the new Bretagne Réunie. Bretagne Réunie must express itself more clearly and thereby gain more visibility among the regional organisations whose headquarters are located in Rennes. Bretagne Réunie must urge the local representatives from the five departments that signed the Reunification Charter to constitute an Assembly of Brittany's representatives on the model of the Assembly constituted by the Representatives of the North and South Basque Country. The mixte Commission should then extend its competencies to economic and European issues. The main candidates to the next presidential elections must be requested to add the reunification issue on their respective political agendas. by our will to fight.